“The choicest fruit of Hindustan for garden pride the mango is sought. Ere ripe, other fruits to cut we ban, but mango serves, ripe or not.” says Amir Khusro in his Persian verse. This is so true. Mangoes are loved the world over, not least in India where the mango is used to make kulfi (Indian ice-cream), chutney – see my recipe here, or as a sweet mango lassi. At Boro Amma’s (my husband’s granny) house in Kolkata a mango tree stands bearing sweet fruit outside the kitchen window. The rustle of the leaves in the gently breeze and the sweet scent of the mangoes is always tempting us. When the fruit is tok (sour) we prepare mango chutney, which is heavenly. 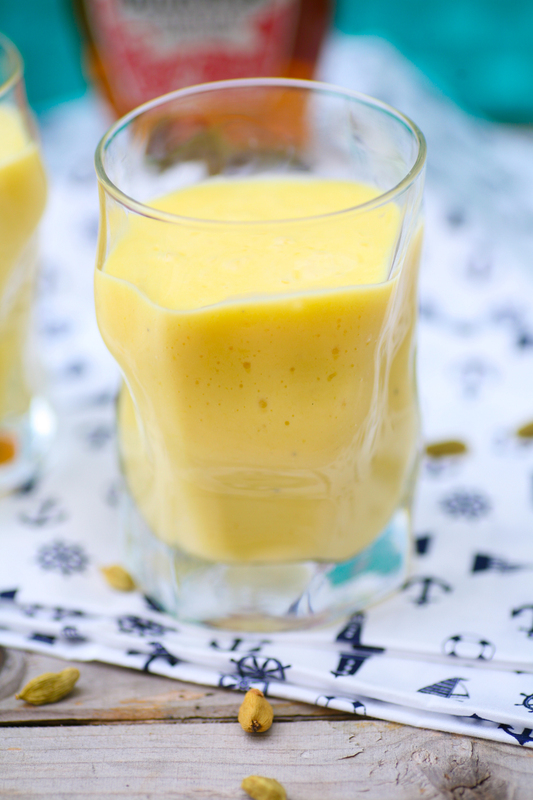 As the fruit softens we sip on mango lassi, which cools us in the heat of the day. This year mangoes imported from India, including the legendary Alphonso mangoes, where banned by the EU after authorities in Brussels found some mangoes infested with fruit flies, which they fear could damage European salad crops. So while it is possible to buy mangoes here in the shops in the UK, we were not able to feast on the lusciously sweet Alphonso, much to the everyone’s chagrin. 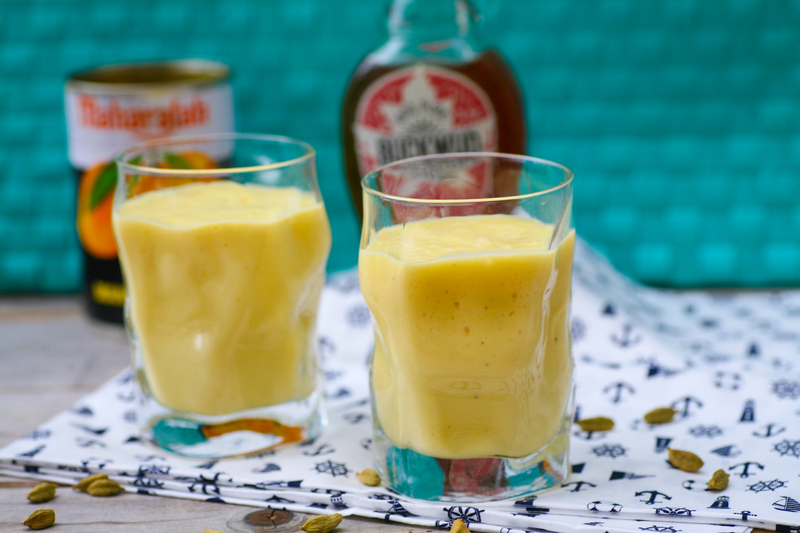 Making mango lassi does not necessarily require fresh mangoes however. 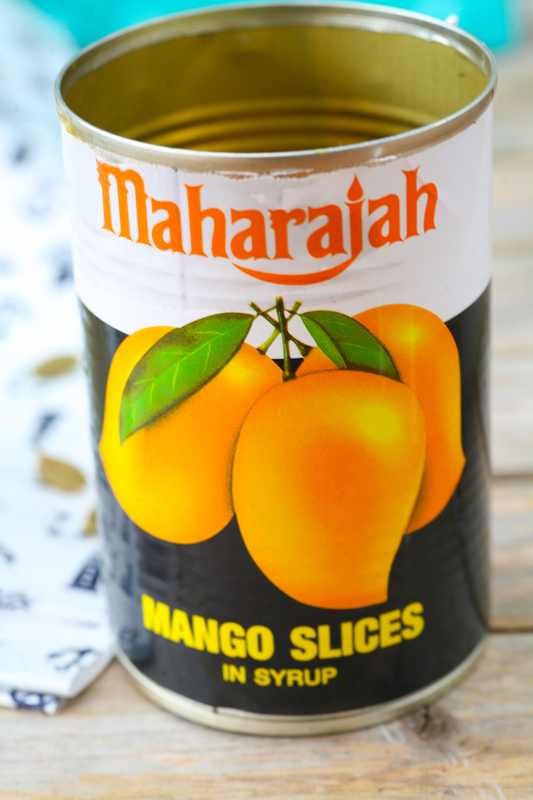 Tinned mangoes will also work equally well and for this recipe I used tinned. It’s so simple and sweetly delicious I urge you to try it one hot summers day. 1. 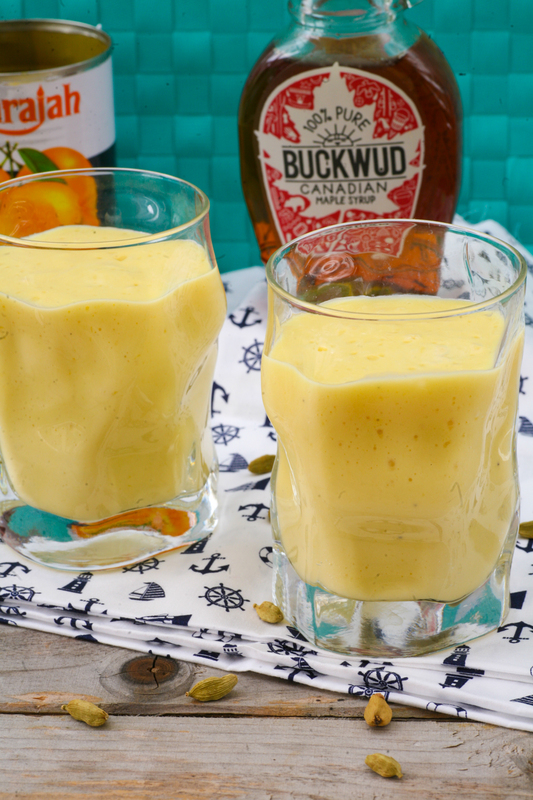 After straining the syrup from the mangoes add all the ingredients and blend together in a juicer/blender. If you prefer it thinner in consistency simply add a little extra milk or water. Serve in glasses on warm summer days. This entry was posted in Drinks and tagged alphonso, drinks, Indian, lassi, mangoes, smoothie. Bookmark the permalink. Love mango lassi any day! 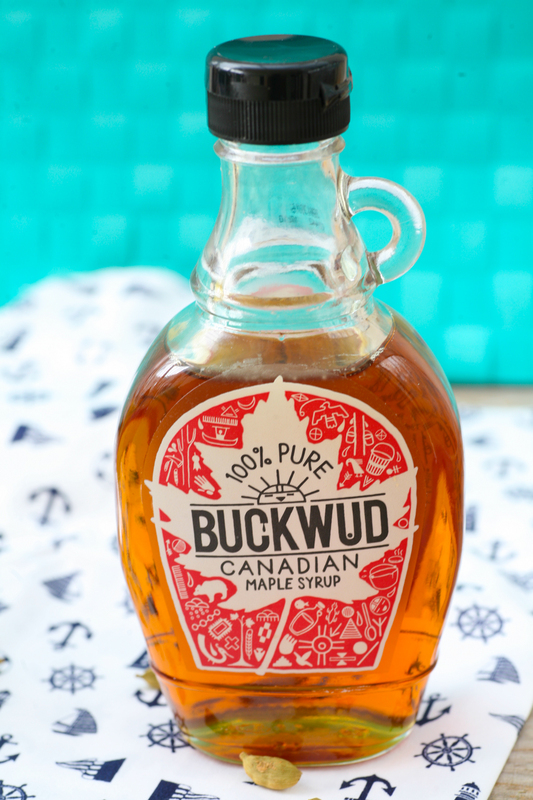 It’s definitely a happy drink – the colour, taste and sweetness all remind me of hot summer days. Yes it adds a nice spice touch to the drink. Perfect for hot weather. Enjoy.